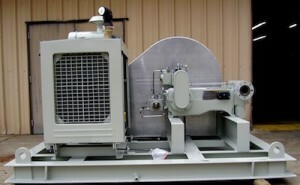 Centrifugals are one of the most common types of pumps. By use of an internal impeller, the rotational force of the motor is converted to the movement of fluid. Because of their simple design, they can be adapted to many different applications. We’ve built & repaired thousands of centrifugal pumps & packages from most manufacturers, including Aurora, Goulds, and Cornell. Pneumatic, or Air-Operated-Double-Diaphragms are great assets for a variety of applications. They can pump chemicals, solids, oil, slurry, water, and more. They may not be the most efficient pumps for every application, but they are inexpensive, lightweight, and easy to install and maintain. Our recommended brands are Wilden and Graco. These are positive displacement pumps that move fluid through internal rotating gears. They work well in applications with viscous fluids such as oil and adhesives. Another advantage is that they are bi-rotational, giving the operator the ability to pump in either direction; for example, loading and unloading sea vessels. These are positive displacement pumps as well. They are commonly used in pipeline or salt-water disposal applications. Upfront costs are typically higher on plunger pumps, but the longevity usually pays for itself. 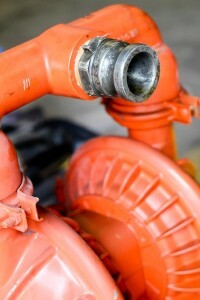 If these pumps are well-maintained, they can last many decades. We rebuild all manufacturers, but our lines include Aplex, and Hammelmann. Self-primers are centrifugal pumps that can handle solids. Their signature characteristic (and namesake) is that they can run dry. This can save operator time and equipment cost when suction line availability is not always constant. Check out our self-primer brands, including Cornell and Allprime. Specially designed to pump small amounts of chemical against large amounts of pressure, these pumps are most commonly used in oil and gas pipelines and production facilities. 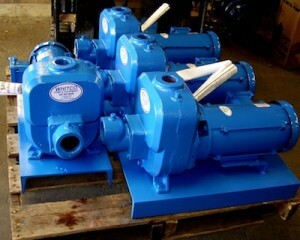 At their core, they are positive displacement plunger pumps. They can be run electrically or pneumatically. We rep the top brands in the industry, including CheckPoint, Flomore, and Graco. If cavitation and efficiency are primary concerns, a submersible may be your answer. 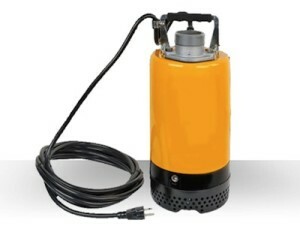 Because of its design and location in the fluid being pumped, a submersible is able to reduce the common malfunctions that occur on the suction end of non-submersible pumps. We offer many options, including Cornell and Zoeller.